Robin Youngs, Guy Kenyon,	The Journal of Laryngology & Otology, Volume 122 Issue 1, pp 1-2. The Journal of Laryngology & Otology, Volume 122 Issue 9, p 1015. The Journal of Laryngology & Otology, Volume 122 Issue 10, pp 1133-1134. The Journal of Laryngology & Otology, Volume 122 Issue 7, p 764. The Journal of Laryngology & Otology, Volume 122 Issue 9, p 1016. The Journal of Laryngology & Otology, Volume 122 Issue 4, pp 432-433. The Journal of Laryngology & Otology, Volume 122 Issue 5, pp 540-542. The Journal of Laryngology & Otology, Volume 122 Issue 5, pp 543-544. The Journal of Laryngology & Otology, Volume 122 Issue 2, p 217. R Hofman, H J Rosingh,	The Journal of Laryngology & Otology, Volume 122 Issue 3, p .
Y S Yang, K H Hong,	The Journal of Laryngology & Otology, Volume 122 Issue 8, p .
H M Hegazy, O A Albirmawy, A H Kaka, A S Behiry,	The Journal of Laryngology & Otology, Volume 122 Issue 4, pp 369-373. A Scinska, A Jodkowska, A Korkosz, W Kukwa, H Sienkiewicz-Jarosz,	The Journal of Laryngology & Otology, Volume 122 Issue 2, p .
A Gadodia, A Seith, R Sharma, A Thakar,	The Journal of Laryngology & Otology, Volume 122 Issue 3, p .
Is there an association between blood group O and epistaxis? V M Reddy, M Daniel, E Bright, S R Broad, A A Moir,	The Journal of Laryngology & Otology, Volume 122 Issue 4, pp 366-368. B K Vikram, N Khaja, S G Udayashankar, B K Venkatesha, D Manjunath,	The Journal of Laryngology & Otology, Volume 122 Issue 5, pp 442-446. Y Seino, M Nakayama, M Okamoto, S Yokobori, M Takeda, S Miyamoto,	The Journal of Laryngology & Otology, Volume 122 Issue 7, pp 745-749. M V Akdogan, E Aydin, O N Ozgirgin,	The Journal of Laryngology & Otology, Volume 122 Issue 8, p .
S Aslan, H Yavuz, A C Cagici, O Kizilkilic,	The Journal of Laryngology & Otology, Volume 122 Issue 7, pp 737-740. H-S Lee, S-D Hong, S H Hong, Y-S Cho, W-H Chung,	The Journal of Laryngology & Otology, Volume 122 Issue 4, pp 351-356. S L Woolley, A Espeso, D R K Smith,	The Journal of Laryngology & Otology, Volume 122 Issue 2, p .
I O Ott, P R Issing,	The Journal of Laryngology & Otology, Volume 122 Issue 3, p .
E Covelli, E De Seta, F Zardo, D De Seta, R Filipo,	The Journal of Laryngology & Otology, Volume 122 Issue 8, p .
A Gungor, S Dogru, H Cincik, E Erkul, E Poyrazoglu,	The Journal of Laryngology & Otology, Volume 122 Issue 5, pp 447-451. E Chng, C-C Yip, J C Y Lee,	The Journal of Laryngology & Otology, Volume 122 Issue 3, p .
P J Clamp,	The Journal of Laryngology & Otology, Volume 122 Issue 7, pp 687-690. V Osei-Lah, B Ceranic, L M Luxon,	The Journal of Laryngology & Otology, Volume 122 Issue 5, pp 452-457. O V Akinpelu, Y B Amusa, E O Komolafe, A A Adeolu, A O Oladele, S A Ameye,	The Journal of Laryngology & Otology, Volume 122 Issue 1, pp 16-20. Pan Qiong, Z Hu, Y Feng, Q Pan, J Xia, K Xia,	The Journal of Laryngology & Otology, Volume 122 Issue 10, pp 1029-1036. H E Ozel, G Ergul, O E Gur, S Kulacoglu, C Ozdem,	The Journal of Laryngology & Otology, Volume 122 Issue 9, p .
Z Siti Aishah, M D Mohd Khairi, A R Normastura, Z Zafarina, B A Zilfalil,	The Journal of Laryngology & Otology, Volume 122 Issue 12, pp 1284-1288. M Viccaro, E De Seta, E Covelli, V Marvaso, R Filipo,	The Journal of Laryngology & Otology, Volume 122 Issue 4, p .
H Singh, J Thomas, W L E Hoe, D S Sethi,	The Journal of Laryngology & Otology, Volume 122 Issue 8, p .
A N Erkan, H Yavuz, C Ozer, F Ozer, L Ozluoglu,	The Journal of Laryngology & Otology, Volume 122 Issue 4, pp 397-402. M Prior, N Gibbins, G John, S Rhys-Williams, P Scott,	The Journal of Laryngology & Otology, Volume 122 Issue 2, p .
L Al-Shammari, A Majithia, A Adams, P Chatrath,	The Journal of Laryngology & Otology, Volume 122 Issue 3, p .
C Kiese-Himmel,	The Journal of Laryngology & Otology, Volume 122 Issue 5, pp 458-465. Y-H Bai, C-C Ren, X-R Gong, L-P Meng,	The Journal of Laryngology & Otology, Volume 122 Issue 10, pp 1037-1041. R Teggi, N Ceserani, F Lira Luce, A Lazzarin, M Bussi,	The Journal of Laryngology & Otology, Volume 122 Issue 12, pp 1289-1294. I M Vlastos, J Hajiioannou, M Houlakis,	The Journal of Laryngology & Otology, Volume 122 Issue 1, pp 21-24. F G Fiorino, L Bertolasi, F Barbieri,	The Journal of Laryngology & Otology, Volume 122 Issue 8, pp 767-772. Clinical diagnosis of Ménière's disease: how useful are the American Academy of Otolaryngology Head and Neck Surgery Committee on Hearing and Equilibrium guidelines? E Stapleton, R Mills,	The Journal of Laryngology & Otology, Volume 122 Issue 8, pp 773-779. A Üneri, S Polat,	The Journal of Laryngology & Otology, Volume 122 Issue 5, pp 466-469. H Yaman, K Ozturk, Y Uyar, M Gurbilek,	The Journal of Laryngology & Otology, Volume 122 Issue 1, pp 25-30. R Arora, R Gupta, Amit Kumar Dinda,	The Journal of Laryngology & Otology, Volume 122 Issue 4, p .
S G Korres, C E Papadakis, M G Riga, D G Balatsouras, D G Dikeos, C R Soldatos,	The Journal of Laryngology & Otology, Volume 122 Issue 12, pp 1295-1298. E C Ho, J-Y Chan,	The Journal of Laryngology & Otology, Volume 122 Issue 7, pp 696-699. N D Zingade, N N Zingade,	The Journal of Laryngology & Otology, Volume 122 Issue 3, p .
P P Cheang, D Kim, T J Rockley,	The Journal of Laryngology & Otology, Volume 122 Issue 10, pp 1042-1046. P M Moreno, D H Meseguer,	The Journal of Laryngology & Otology, Volume 122 Issue 5, pp 470-475. M Sadlier, S D G Stephens, V Kennedy,	The Journal of Laryngology & Otology, Volume 122 Issue 1, pp 31-37. E Smale, S McDonald, N Maha, S Short,	The Journal of Laryngology & Otology, Volume 122 Issue 8, pp 780-785. B Gunduz, Y A Bayazit, F Celenk, C Sarıdoğan, A G Guclu, E Orcan, J Meray,	The Journal of Laryngology & Otology, Volume 122 Issue 10, pp 1047-1051. C Georgalas, J Xenellis, D Davilis, A Tzangaroulakis, E Ferekidis,	The Journal of Laryngology & Otology, Volume 122 Issue 12, pp 1299-1304. S C L Leong, M Abdelkader, P S White,	The Journal of Laryngology & Otology, Volume 122 Issue 1, pp 38-41. A Sastry, P D Karkos, S Leong, S Hampal,	The Journal of Laryngology & Otology, Volume 122 Issue 7, p .
F E Ologe, T G Olajide, C C Nwawolo, B A Oyejola,	The Journal of Laryngology & Otology, Volume 122 Issue 8, pp 786-794. M Barakate, I Bottrill,	The Journal of Laryngology & Otology, Volume 122 Issue 2, pp 120-124. M Koçer, T Güldür, M Akarçay, M C Miman, G Beker,	The Journal of Laryngology & Otology, Volume 122 Issue 9, pp 881-886. S Anari, G Ainsworth, A K Robson,	The Journal of Laryngology & Otology, Volume 122 Issue 5, pp 476-479. M H Fritsch,	The Journal of Laryngology & Otology, Volume 122 Issue 12, pp 1305-1308. M I Trotter, I Donaldson,	The Journal of Laryngology & Otology, Volume 122 Issue 10, pp 1052-1056. M Sugiura, S Naganawa, I M Ishida, M Teranishi, S Nakata, T Yoshida, T Nakashima,	The Journal of Laryngology & Otology, Volume 122 Issue 9, pp 887-892. F Glynn, L Osman, M Colreavy, H Rowley, T P O Dwyer, A Blayney,	The Journal of Laryngology & Otology, Volume 122 Issue 3, pp 233-237. S Cafer, I Bayramoglu, N Uzum, M Yilmaz, L Memis, K Uygur,	The Journal of Laryngology & Otology, Volume 122 Issue 2, pp 125-127. K Yelken, M Guven, M Topak, E Gultekin, F Turan,	The Journal of Laryngology & Otology, Volume 122 Issue 4, pp 378-382. T Mackle, S S Gendy, M Walsh, R McConn-Walsh, R W Costello, M-T Walsh,	The Journal of Laryngology & Otology, Volume 122 Issue 12, pp 1309-1317. A Iriz, K Cagli, C Gocer, E Dursun, H Korkmaz, A Eryilmaz,	The Journal of Laryngology & Otology, Volume 122 Issue 8, pp 795-798. M Sajjad, A A Khattak, J E G Bunn, I Mackenzie,	The Journal of Laryngology & Otology, Volume 122 Issue 10, pp 1057-1063. I K Rustom, J A T Sandoe, Z G G Makura,	The Journal of Laryngology & Otology, Volume 122 Issue 5, pp 480-484. Complications after type one thyroplasty: is day-case surgery feasible? D Bray, J P Young, M L Harries,	The Journal of Laryngology & Otology, Volume 122 Issue 7, pp 715-718. Obstructive sleep apnoea adenotonsillectomy in children: when to refer to a centre with a paediatric intensive care unit? E J S M Blenke, A R Anderson, Hemal Raja, S Bew, L C Knight,	The Journal of Laryngology & Otology, Volume 122 Issue 1, pp 42-45. P Puwanarajah, P Pretorius, I Bottrill,	The Journal of Laryngology & Otology, Volume 122 Issue 7, pp 741-744. I N Steen, K MacKenzie, P N Carding, A Webb, I J Deary, J A Wilson,	The Journal of Laryngology & Otology, Volume 122 Issue 1, pp 46-51. K Sharma, P Sharma, A Sharma, G Singh,	The Journal of Laryngology & Otology, Volume 122 Issue 10, pp 1064-1073. K M J Green, P J Julyan, D L Hastings, R T Ramsden,	The Journal of Laryngology & Otology, Volume 122 Issue 3, pp 238-245. A Sethi, D Sethi, A K Agarwal, S Nigam, A Gupta,	The Journal of Laryngology & Otology, Volume 122 Issue 8, pp 799-804. C Pinto de Moura, D Andrade, L M Cunha, M J Tavares, M J Cunha, P Vaz, H Barros, S M Pueschel, M Pais Clemente,	The Journal of Laryngology & Otology, Volume 122 Issue 12, pp 1318-1324. A Aghamohammadi, K Moazzami, N Rezaei, A Karimi, M Movahedi, M Gharagozlou, S Abdollahzade, N Pouladi, A Kouhi, M Moin,	The Journal of Laryngology & Otology, Volume 122 Issue 4, pp 409-413. G Sonmez, V Turhan, M G Senol, E Ozturk, H O Sildiroglu, H Mutlu,	The Journal of Laryngology & Otology, Volume 122 Issue 9, pp 893-897. T Khrais, G Romano, M Sanna,	The Journal of Laryngology & Otology, Volume 122 Issue 2, pp 128-131. O Reichel, W J Issing,	The Journal of Laryngology & Otology, Volume 122 Issue 5, pp 485-489. O V Akinpelu,	The Journal of Laryngology & Otology, Volume 122 Issue 7, pp 762-763. S Berrettini, F Forli, S Passetti,	The Journal of Laryngology & Otology, Volume 122 Issue 3, pp 246-252. H Li, B Zhou, J Shi, L Cheng, W Wen, G Xu,	The Journal of Laryngology & Otology, Volume 122 Issue 12, pp 1325-1329. S-T Toh, P-P Hsu, Y-H Ng, T-W D Teo, K-L A Tan, K-S P Lu,	The Journal of Laryngology & Otology, Volume 122 Issue 5, pp 490-494. C M Philpott, P Goonetilleke, P C Goodenough, A Clark, G E Murty,	The Journal of Laryngology & Otology, Volume 122 Issue 8, pp 805-809. P Casserly, C Timon,	The Journal of Laryngology & Otology, Volume 122 Issue 1, pp 52-56. W Chien, M J McKenna, J J Rosowski, S N Merchant,	The Journal of Laryngology & Otology, Volume 122 Issue 9, pp 898-904. J R Newton, M Shakeel, B Ram,	The Journal of Laryngology & Otology, Volume 122 Issue 4, pp 357-360. A C Leong, F Barker, N R Bleach,	The Journal of Laryngology & Otology, Volume 122 Issue 2, pp 132-138. R J Obholzer, S A R Nouraei, J Ahmed, M R Kadhim, G S Sandhu,	The Journal of Laryngology & Otology, Volume 122 Issue 1, pp 57-60. E Stapleton, R Mills,	The Journal of Laryngology & Otology, Volume 122 Issue 2, pp 139-144. P Pujary, K Pujary, S G Mahesh, M Valiathan,	The Journal of Laryngology & Otology, Volume 122 Issue 7, p .
T W Chiu, J Shaw-Dunn, G W McGarry,	The Journal of Laryngology & Otology, Volume 122 Issue 10, pp 1074-1077. J Borgstein, G de Zwart, I A Bruce,	The Journal of Laryngology & Otology, Volume 122 Issue 3, pp 253-254. P Burns, J Doody, C Timon,	The Journal of Laryngology & Otology, Volume 122 Issue 5, pp 495-499. P C Modayil, V Jacob, G Manjaly, G Watson,	The Journal of Laryngology & Otology, Volume 122 Issue 4, pp 428-431. G Racic, D Kurtovic, Z Colovic, Z Dogas, G Kardum, Z Roje,	The Journal of Laryngology & Otology, Volume 122 Issue 12, pp 1330-1334. H Sudhoff, S Rajagopal, D M Baguley, J Ebmeyer, A Schmelzer, S Schreiber, D A Moffat,	The Journal of Laryngology & Otology, Volume 122 Issue 9, pp 905-911. N M Rankhethoa, C A J Prescott,	The Journal of Laryngology & Otology, Volume 122 Issue 8, pp 810-813. J Maclean, S Cotton, A Perry,	The Journal of Laryngology & Otology, Volume 122 Issue 7, pp 728-732. J D Snelling, M Krywawych, A Majithia, J P Harcourt,	The Journal of Laryngology & Otology, Volume 122 Issue 3, pp 255-258. V Dhar, K Young, S A R Nouraei, G S Sandhu, T Tatla, R Farrell, D Vaughan,	The Journal of Laryngology & Otology, Volume 122 Issue 12, pp 1335-1338. K Fung, N D Hogikyan, S B Heavner, D Ekbom, E L Feldman,	The Journal of Laryngology & Otology, Volume 122 Issue 5, pp 500-505. R K Bhalla, A S Jones, N J Roland,	The Journal of Laryngology & Otology, Volume 122 Issue 10, pp 1078-1083. T-K Chao, C-M Liu, W-H Huang,	The Journal of Laryngology & Otology, Volume 122 Issue 8, pp 814-817. Olfactory clearance: what time is needed in clinical practice? C M Philpott, C R Wolstenholme, P C Goodenough, A Clark, G E Murty,	The Journal of Laryngology & Otology, Volume 122 Issue 9, pp 912-917. İ Aladag, Y Bulut, M Guven, A Eyibilen, K Yelken,	The Journal of Laryngology & Otology, Volume 122 Issue 1, pp 61-64. What proportion of patients referred to an otolaryngology vertigo clinic have an otological cause for their symptoms? A K Arya, D A Nunez,	The Journal of Laryngology & Otology, Volume 122 Issue 2, pp 145-149. K Sato, Y Miyajima, S Izumaru, T Nakashima,	The Journal of Laryngology & Otology, Volume 122 Issue 12, pp 1339-1342. S Schmitz, P Zengel, I Alvir, M Andratschke, A Berghaus, S Lang,	The Journal of Laryngology & Otology, Volume 122 Issue 1, pp 65-71. P S Randhawa, A D Ramsay, J S Rubin,	The Journal of Laryngology & Otology, Volume 122 Issue 7, pp 750-753. K Sato,	The Journal of Laryngology & Otology, Volume 122 Issue 9, pp 918-920. R Tahamiler, S Canakcioglu, S Yilmaz, A Dirican,	The Journal of Laryngology & Otology, Volume 122 Issue 2, pp 150-154. L-A Guldfred, D Lyhne, B C Becker,	The Journal of Laryngology & Otology, Volume 122 Issue 8, pp 818-823. S Robertson, H Kubba,	The Journal of Laryngology & Otology, Volume 122 Issue 10, pp 1084-1087. P Sheahan, R McConn-Walsh, M Walsh, R W Costello,	The Journal of Laryngology & Otology, Volume 122 Issue 3, pp 259-263. A G Bibas, J Xenellis, L Michaels, S Anagnostopoulou, E Ferekidis, A Wright,	The Journal of Laryngology & Otology, Volume 122 Issue 4, pp 336-342. Hypopharyngeal cancer treatment based on definitive radiotherapy: who is suitable for laryngeal preservation? S-W Chen, M-H Tsai, S-N Yang, J-A Liang, A-C Shiau, F-J Lin,	The Journal of Laryngology & Otology, Volume 122 Issue 5, pp 506-512. K Görür, Ö Görüroğlu Öztürk, G Polat, Y Vayisoğlu, D Ü Talas, N Güner, C Özcan,	The Journal of Laryngology & Otology, Volume 122 Issue 4, pp 343-346. U Barbaros, Y Erbil, N Aksakal, G Çıtlak, H İşsever, A Bozbora, S Özarmağan,	The Journal of Laryngology & Otology, Volume 122 Issue 12, pp 1343-1348. E J Damrose, J F Damrose,	The Journal of Laryngology & Otology, Volume 122 Issue 8, pp 824-828. Xu-Hong Zhou, Shi-Ming Chen, Dan Liu, Yan Wang, Bo-Kui Xiao, Ze-Zhang Tao,	The Journal of Laryngology & Otology, Volume 122 Issue 5, pp 513-521. N Jayashankar, K P Morwani, M J Shaan, S R Bhatia, K T Patil,	The Journal of Laryngology & Otology, Volume 122 Issue 10, pp 1088-1091. M Ikeda, A Ikui, A Komiyama, D Kobayashi, M Tanaka,	The Journal of Laryngology & Otology, Volume 122 Issue 2, pp 155-160. C Brewis, M Yung, C Merkonidis, S Hardman-Lea,	The Journal of Laryngology & Otology, Volume 122 Issue 9, pp 921-923. S E McDonald, P J Robinson, D A Nunez,	The Journal of Laryngology & Otology, Volume 122 Issue 3, pp 264-267. D Beutner, J C Luers, K B Huttenbrink,	The Journal of Laryngology & Otology, Volume 122 Issue 7, pp 682-686. T Guo, J W Sun, Q P Lv, X G Li,	The Journal of Laryngology & Otology, Volume 122 Issue 1, pp 72-77. D J Tweedie, C J Skilbeck, L A Cochrane, J Cooke, M E Wyatt,	The Journal of Laryngology & Otology, Volume 122 Issue 2, pp 161-169. H Abd El-Fattah, Y A Nour, A El-Daly,	The Journal of Laryngology & Otology, Volume 122 Issue 3, pp 268-276. C-P Wang, C-Y Lee, P-J Lou, R-F Yen, J-K Hsiao, J-Y Ko,	The Journal of Laryngology & Otology, Volume 122 Issue 12, pp 1349-1353. A-L Hamdan, G Kanazi, C Rameh, H Rifai, A Sibai,	The Journal of Laryngology & Otology, Volume 122 Issue 8, pp 829-835. D G Farwell, P C Belafsky, C J Rees,	The Journal of Laryngology & Otology, Volume 122 Issue 10, pp 1092-1095. E Stapleton, R Mills, J C Tham,	The Journal of Laryngology & Otology, Volume 122 Issue 4, pp 347-350. S E Lester, A K Robson, M Bearn,	The Journal of Laryngology & Otology, Volume 122 Issue 9, pp 924-927. J C Ryan, B McGuire,	The Journal of Laryngology & Otology, Volume 122 Issue 10, pp 1096-1099. K Daniels, K Haddow,	The Journal of Laryngology & Otology, Volume 122 Issue 5, pp 524-526. S J Davis, R Salib, H Buchan, E Nilssen,	The Journal of Laryngology & Otology, Volume 122 Issue 1, pp 82-85. A M Kelly, M J Drinnan, L Savy, D J Howard,	The Journal of Laryngology & Otology, Volume 122 Issue 12, pp 1354-1359. S-I Chitose, H Umeno, S Hamakawa, T Nakashima, H Shoji,	The Journal of Laryngology & Otology, Volume 122 Issue 2, pp 170-176. D Cikojević, I Glunčić, V Pešutić-Pisac,	The Journal of Laryngology & Otology, Volume 122 Issue 8, pp 836-839. B A Woodworth, A G Chiu, N A Cohen, D W Kennedy, B W O'Malley, J N Palmer,	The Journal of Laryngology & Otology, Volume 122 Issue 4, pp 361-365. S B Megalamani, G Suria, U Manickam, D Balasubramanian, S Jothimahalingam,	The Journal of Laryngology & Otology, Volume 122 Issue 9, pp 928-930. S-E Stangerup, P Caye-Thomasen, M Tos, J Thomsen,	The Journal of Laryngology & Otology, Volume 122 Issue 7, pp 673-681. M Dagli, I Sati, A Acar, R E Stone, G Dursun, A Eryilmaz,	The Journal of Laryngology & Otology, Volume 122 Issue 3, pp 277-281. Post-tonsillectomy morbidity statistics: are they underestimated? J Doshi, M Damadora, S Gregory, S Anari,	The Journal of Laryngology & Otology, Volume 122 Issue 4, pp 374-377. P Kurnatowski, L Putyński, M Łapienis, B Kowalska,	The Journal of Laryngology & Otology, Volume 122 Issue 9, pp 931-935. M Shakeel, J R Newton, J Bruce, K W Ah-See,	The Journal of Laryngology & Otology, Volume 122 Issue 12, pp 1360-1364. D M Hartl, M Julieron, A-M LeRidant, F Janot, P Marandas, J-P Travagli,	The Journal of Laryngology & Otology, Volume 122 Issue 10, pp 1100-1104. S Georgopoulos, S Korres, M Riga, D Balatsouras, G Kotsis, E Ferekidis,	The Journal of Laryngology & Otology, Volume 122 Issue 5, pp 527-530. J Ahmed, S De, I D B Hore, C M Bailey, B E J Hartley,	The Journal of Laryngology & Otology, Volume 122 Issue 8, pp 840-844. K Kaygusuz, A Yildirim, I Ozdemir Kol, S Gursoy, C Mimaroglu,	The Journal of Laryngology & Otology, Volume 122 Issue 7, pp 691-695. E A Magdy, S Elwany, A S El-Daly, M Abdel-Hadi, M A Morshedy,	The Journal of Laryngology & Otology, Volume 122 Issue 3, pp 282-290. J Barraclough, H Uppal, S Silverman, C Helpert, J O'Connell,	The Journal of Laryngology & Otology, Volume 122 Issue 1, pp 86-87. Martin W Pak, Samuel Chow, C A van Hasselt,	The Journal of Laryngology & Otology, Volume 122 Issue 2, pp 177-180. L D'Alatri, S Galla, M Rigante, O Antonelli, S Buldrini, M R Marchese,	The Journal of Laryngology & Otology, Volume 122 Issue 9, pp 936-941. S E McDonald, N K Chadha, R S Mills,	The Journal of Laryngology & Otology, Volume 122 Issue 10, pp 1105-1108. T Chalastras, P Nicolopoulou-Stamati, E Patsouris, A Eleftheriadou, D Kandiloros, I Yiotakis, M Gonidi, P Athanassiadou,	The Journal of Laryngology & Otology, Volume 122 Issue 7, pp 700-706. Lateral soft tissue neck X-rays: are they useful in management of upper aero-digestive tract foreign bodies? A Karnwal, E C Ho, A Hall, N Molony,	The Journal of Laryngology & Otology, Volume 122 Issue 8, pp 845-847. D Cohen, M Dor,	The Journal of Laryngology & Otology, Volume 122 Issue 1, pp 88-92. Is bacterial colonisation of the tonsillar fossa a factor in post-tonsillectomy haemorrhage? J C Stephens, C Georgalas, M Kyi, K Ghufoor,	The Journal of Laryngology & Otology, Volume 122 Issue 4, pp 383-387. B-B Yang, H Jiang, H-Y Chang,	The Journal of Laryngology & Otology, Volume 122 Issue 5, pp 531-534. Y Erbil, U Barbaros, N Özbey, Y Kapran, M Tükenmez, A Bozbora, S Özarmağan,	The Journal of Laryngology & Otology, Volume 122 Issue 3, pp 291-295. A C Van Lierop, J J Fagan,	The Journal of Laryngology & Otology, Volume 122 Issue 2, pp 181-187. R J Sim, S McDonald, S Gillett,	The Journal of Laryngology & Otology, Volume 122 Issue 4, pp 388-390. Z-M Lin, Y-L Chang, C-Y Lee, C-P Wang, T-Y Hsiao,	The Journal of Laryngology & Otology, Volume 122 Issue 1, pp 93-96. T S Korampalli, A Belloso, P S Hans, K Irion, I J Sheppard,	The Journal of Laryngology & Otology, Volume 122 Issue 5, pp 535-537. M Geraghty, F Glynn, M Amin, J Kinsella,	The Journal of Laryngology & Otology, Volume 122 Issue 3, pp 296-298. J B Van Rijswijk, E A M Mylanus,	The Journal of Laryngology & Otology, Volume 122 Issue 12, pp 1368-1370. S K Sarkar, N B Patra, J Goswami, S Basu,	The Journal of Laryngology & Otology, Volume 122 Issue 2, pp 188-192. Y J Choi, J S Chung, H-J Shin, G J Cho, S G Wang, B J Lee, B M Cho, Y D Joo, C H Sohn,	The Journal of Laryngology & Otology, Volume 122 Issue 8, pp 848-853. Does hormone replacement therapy in post-menopausal women have any effect upon nasal physiology? D C Wild, C M Philpott, C R Wolstenholme, G E Murty,	The Journal of Laryngology & Otology, Volume 122 Issue 7, pp 707-710. F Debruyne, G Geuens, V Vander Poorten, P Delaere,	The Journal of Laryngology & Otology, Volume 122 Issue 9, pp 942-947. P Burns, I Miller, C Timon, M Walsh,	The Journal of Laryngology & Otology, Volume 122 Issue 3, pp 299-302. B Joshua, D M Kaplan, E Raveh, D Lotan, Y Anikster,	The Journal of Laryngology & Otology, Volume 122 Issue 2, pp 193-198. D C Tong, M R Leaper, A N Colquhoun, A M Rich,	The Journal of Laryngology & Otology, Volume 122 Issue 10, pp 1112-1114. V A Lachanas, G T Karatzias, I Tsitiridis, I Panaras, V G Sandris,	The Journal of Laryngology & Otology, Volume 122 Issue 1, pp 97-99. S A C MacKeith, S Frampton, D D Pothier,	The Journal of Laryngology & Otology, Volume 122 Issue 7, pp 711-714. S Motta, U Cesari, M Mesolella, G Motta,	The Journal of Laryngology & Otology, Volume 122 Issue 9, pp 948-951. A A Gaafar, A A El-Daly, H A Gaafar,	The Journal of Laryngology & Otology, Volume 122 Issue 4, pp 391-396. N A Khalidi, R Rebello, D D Robertson,	The Journal of Laryngology & Otology, Volume 122 Issue 12, pp 1371-1376. H Beaumont, N Sharma, S K Ahmed, J E O'Connell,	The Journal of Laryngology & Otology, Volume 122 Issue 5, pp 538-539. Preliminary report of associated factors in wound infection after major head and neck neoplasm operations — does the duration of prophylactic antibiotic matter? S-A Liu, K-C Tung, J-Y Shiao, Y-T Chiu,	The Journal of Laryngology & Otology, Volume 122 Issue 4, pp 403-408. I Dallan, S Berrettini, E Neri, A P Casani,	The Journal of Laryngology & Otology, Volume 122 Issue 8, pp 858-860. A Thakar, K K Deepak, S Shyam Kumar,	The Journal of Laryngology & Otology, Volume 122 Issue 10, pp 1115-1117. E C Gan, D P C Lau, K L Chuah,	The Journal of Laryngology & Otology, Volume 122 Issue 1, pp 100-104. Y-L Yuan, X-H Zhou, Jian Song, X-P Qiu, Jun Li, L-F Ye,	The Journal of Laryngology & Otology, Volume 122 Issue 9, pp 952-960. O Alhamarneh, H Raja, R J A England,	The Journal of Laryngology & Otology, Volume 122 Issue 7, pp 719-721. H Kouzaki, J Fukui, T Shimizu,	The Journal of Laryngology & Otology, Volume 122 Issue 12, pp 1377-1380. H-J Shin, J S Chung, Y J Choi, B J Lee, S G Wang, D W Kim, G J Cho,	The Journal of Laryngology & Otology, Volume 122 Issue 7, pp 722-727. J M Hilton, P Tassone, J Hanif, B Blagnys,	The Journal of Laryngology & Otology, Volume 122 Issue 1, pp 105-107. A Mazita, B S Gendeh, A I Zainal,	The Journal of Laryngology & Otology, Volume 122 Issue 8, pp 861-863. R Puxeddu, D Cocco, G Parodo, G Mallarini, M Medda, P A Brennan,	The Journal of Laryngology & Otology, Volume 122 Issue 10, pp 1118-1123. I Gunawardena, D Kenwright, N Steventon, C Ferguson,	The Journal of Laryngology & Otology, Volume 122 Issue 4, pp 416-418. M Rollin, A Majithia, M Stearns,	The Journal of Laryngology & Otology, Volume 122 Issue 12, pp 1381-1383. S C L Leong, F Javed, S Elliot, S Mortimore,	The Journal of Laryngology & Otology, Volume 122 Issue 9, pp 961-966. N P Singh, J G Rizk,	The Journal of Laryngology & Otology, Volume 122 Issue 8, pp 864-866. K-T Kang, Y-H Young,	The Journal of Laryngology & Otology, Volume 122 Issue 2, pp 204-206. S Nishiike, Y Hyo, H Fukushima,	The Journal of Laryngology & Otology, Volume 122 Issue 4, pp 419-421. G J Im, H H Jung,	The Journal of Laryngology & Otology, Volume 122 Issue 3, pp 310-313. Is there a difference in quality of life, comparing summer and winter, in patients who have undergone total laryngectomy? F C Van Wyk, F Vaz, M Harries, J Weighill,	The Journal of Laryngology & Otology, Volume 122 Issue 9, pp 967-971. N Choudhury, G Kumar, M Krishnan, D J Gatland,	The Journal of Laryngology & Otology, Volume 122 Issue 10, pp 1124-1126. M A Buchanan, S E Prince, P R Prinsley,	The Journal of Laryngology & Otology, Volume 122 Issue 12, pp 1384-1385. V E S Tan, J Jeevanan, B R Lee,	The Journal of Laryngology & Otology, Volume 122 Issue 8, pp 867-870. A Daneshi, M M Ghassemi, M Talee, S Hassanzadeh,	The Journal of Laryngology & Otology, Volume 122 Issue 3, pp 314-317. L Fraser, A G Howatson, F B MacGregor,	The Journal of Laryngology & Otology, Volume 122 Issue 7, pp 754-756. S Bathala, S Berry, R A Evans, S Brodie, O Altaan,	The Journal of Laryngology & Otology, Volume 122 Issue 10, pp 1127-1129. D Ellul, J Cutajar, H Borg xuereb, M Said,	The Journal of Laryngology & Otology, Volume 122 Issue 2, pp 207-209. A George, W K Smith, S Kumar, A G Pfleiderer,	The Journal of Laryngology & Otology, Volume 122 Issue 12, pp 1386-1388. Familial carotid body tumours: is there a role for genetic screening? P Jani, A A Qureshi, S Verma, L Walker,	The Journal of Laryngology & Otology, Volume 122 Issue 9, pp 978-982. H E V Cupples, D T McGahey,	The Journal of Laryngology & Otology, Volume 122 Issue 4, pp 422-424. A Eryilmaz, M Dagli, M Cayonu, E Dursun, C Gocer,	The Journal of Laryngology & Otology, Volume 122 Issue 9, pp 983-985. M Martinez Del Pero, D Moffat, H Sudhoff,	The Journal of Laryngology & Otology, Volume 122 Issue 4, pp 425-427. 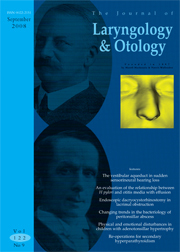 C Page, P Monet, J Peltier, B Bonnaire, V Strunski,	The Journal of Laryngology & Otology, Volume 122 Issue 7, pp 757-761. O Obanor, H O Osazuwa, J E O Amadasun,	The Journal of Laryngology & Otology, Volume 122 Issue 12, pp 1389-1391. M Lim, S Lew-Gor, T Beale, A Ramsay, V J Lund,	The Journal of Laryngology & Otology, Volume 122 Issue 2, pp 210-212. S Kariya, K Fukushima, Y Kataoka, S Tominaga, K Nishizaki,	The Journal of Laryngology & Otology, Volume 122 Issue 8, pp 871-874. L Barker, S Lo, R Sudderick,	The Journal of Laryngology & Otology, Volume 122 Issue 10, pp 1130-1132. Y S Pata, M Ünal, S Gülhan,	The Journal of Laryngology & Otology, Volume 122 Issue 3, pp 318-320. B Creagh-Brown, A Sheth, A Crerar-Gilbert, B P Madden,	The Journal of Laryngology & Otology, Volume 122 Issue 12, pp 1392-1393. S E J Connor, M J Gleeson, E Odell,	The Journal of Laryngology & Otology, Volume 122 Issue 9, pp 986-989. A Siddiqui, S Connor, M Gleeson,	The Journal of Laryngology & Otology, Volume 122 Issue 2, pp 213-216. Abhinandan Bhattacharjee, A Chakraborty, P Purkaystha,	The Journal of Laryngology & Otology, Volume 122 Issue 3, pp 321-323. S Hooda, M R Humphreys, S W Wong, A S Evans,	The Journal of Laryngology & Otology, Volume 122 Issue 9, pp 990-992. E J Damrose,	The Journal of Laryngology & Otology, Volume 122 Issue 12, pp 1394-1396. D McIntosh, M Mahadevan,	The Journal of Laryngology & Otology, Volume 122 Issue 3, pp 324-326. B G Fennessy, P Sheahan, D McShane,	The Journal of Laryngology & Otology, Volume 122 Issue 3, pp 327-328. P A Konstantinopoulos, H Goldsztein, B J Dezube, L Pantanowitz,	The Journal of Laryngology & Otology, Volume 122 Issue 9, pp 993-997. I Khodaei, A Sinha, A Dingle,	The Journal of Laryngology & Otology, Volume 122 Issue 12, pp 1397-1400. S Ali, K MacKenzie, R Reid, G O'Neill, I Ganly,	The Journal of Laryngology & Otology, Volume 122 Issue 9, pp 998-1001. J Pollock, N Beasley,	The Journal of Laryngology & Otology, Volume 122 Issue 12, pp 1401-1403. D P Crampsey, L Cochrane, D Roebuck, B E Hartley,	The Journal of Laryngology & Otology, Volume 122 Issue 9, pp 1002-1004. B Subramanian, S Krishnaraj, K Agrawal, J Soundararagavan,	The Journal of Laryngology & Otology, Volume 122 Issue 9, pp 1005-1007. G Veena, G M Shon, K Usha, R C Nayar,	The Journal of Laryngology & Otology, Volume 122 Issue 9, pp 1008-1011. S Ghosh, R Joy, S Hickey,	The Journal of Laryngology & Otology, Volume 122 Issue 9, pp 1012-1014. G Woodson,	The Journal of Laryngology & Otology, Volume 122 Issue 5, pp 437-441. E Macassey, P Dawes,	The Journal of Laryngology & Otology, Volume 122 Issue 12, pp 1273-1278. A Dowley, E Hoskison, R Allibone, N S Jones,	The Journal of Laryngology & Otology, Volume 122 Issue 10, pp 1019-1023. L J Neilson, S S M Hussain,	The Journal of Laryngology & Otology, Volume 122 Issue 1, pp 3-10. C J Webb, R J Moots, A C Swift,	The Journal of Laryngology & Otology, Volume 122 Issue 12, pp 1279-1283. P C Nankivell, D D Pothier,	The Journal of Laryngology & Otology, Volume 122 Issue 10, pp 1024-1028. C M Philpott, D C McKiernan,	The Journal of Laryngology & Otology, Volume 122 Issue 1, pp 11-15. M B Tarabichi, C Todd, Z Khan, X Yang, B Shehzad, M M Tarabichi,	The Journal of Laryngology & Otology, Volume 122 Issue 9, pp 877-880. D Lubbe, J J Fagan,	The Journal of Laryngology & Otology, Volume 122 Issue 2, pp 111-115. Lateral skull base surgery: a complicated pursuit? V C Cousins,	The Journal of Laryngology & Otology, Volume 122 Issue 3, pp 221-229. F Javed, A Golagani, H Sharp,	The Journal of Laryngology & Otology, Volume 122 Issue 2, pp 116-119. M Yung,	The Journal of Laryngology & Otology, Volume 122 Issue 7, pp 663-672. S Ray, A Masood, J Pickles, I Moumoulidis,	The Journal of Laryngology & Otology, Volume 122 Issue 3, pp 230-232. A Daudia, N S Jones,	The Journal of Laryngology & Otology, Volume 122 Issue 4, pp 331-335. C M Philpott, A Bennett, G E Murty,	The Journal of Laryngology & Otology, Volume 122 Issue 7, pp 657-662. E B Chevretton, L Michaels, A Sandison, C Vanderveld, E Ofo,	The Journal of Laryngology & Otology, Volume 122 Issue 2, p .
The Journal of Laryngology & Otology, Volume 122 Issue 2, p .
Ricard Simo, Leslie Michaels, Ann Sandison, Steve Connor,	The Journal of Laryngology & Otology, Volume 122 Issue 9, p .
H Chau, R Dasgupta, V Sauret, G Kenyon,	The Journal of Laryngology & Otology, Volume 122 Issue 9, pp 972-977. R Raman, O Rahmat,	The Journal of Laryngology & Otology, Volume 122 Issue 7, pp 735-736. R Raman, M B Dahalil, N Prepageran,	The Journal of Laryngology & Otology, Volume 122 Issue 4, pp 414-415. A Tsunoda, A Hatanaka, R Tsunoda, S Kishimoto, K Tsunoda,	The Journal of Laryngology & Otology, Volume 122 Issue 1, pp 78-81. C Hari, C Marnane, P J Wormald,	The Journal of Laryngology & Otology, Volume 122 Issue 5, pp 522-523. H J Park, G H Park, J E Shin, S O Chang,	The Journal of Laryngology & Otology, Volume 122 Issue 12, pp 1365-1367. M Kraft, C Arens,	The Journal of Laryngology & Otology, Volume 122 Issue 10, pp 1109-1111. F Fiorino, F Barbieri,	The Journal of Laryngology & Otology, Volume 122 Issue 8, pp 854-857. R Nandi, A Pajaniappane, R Palaniappan,	The Journal of Laryngology & Otology, Volume 122 Issue 2, pp 199-200. V S Doctor, D J Enepekides, D G Farwell, P C Belafsky,	The Journal of Laryngology & Otology, Volume 122 Issue 3, pp 303-306. Ryouichi Fujii, Koichi Tsunoda,	The Journal of Laryngology & Otology, Volume 122 Issue 2, pp 201-203. F Eifinger, R Lang-Roth, B Braumann, M Saffar, C Huenseler, A Kribs,	The Journal of Laryngology & Otology, Volume 122 Issue 3, pp 307-309. Y Bajaj, C Gadepalli, L C Knight,	The Journal of Laryngology & Otology, Volume 122 Issue 7, pp 733-734. K Sharma, P Sharma, A Sharma, G Singh,	The Journal of Laryngology & Otology, Volume 122 Issue 10, p 1073.